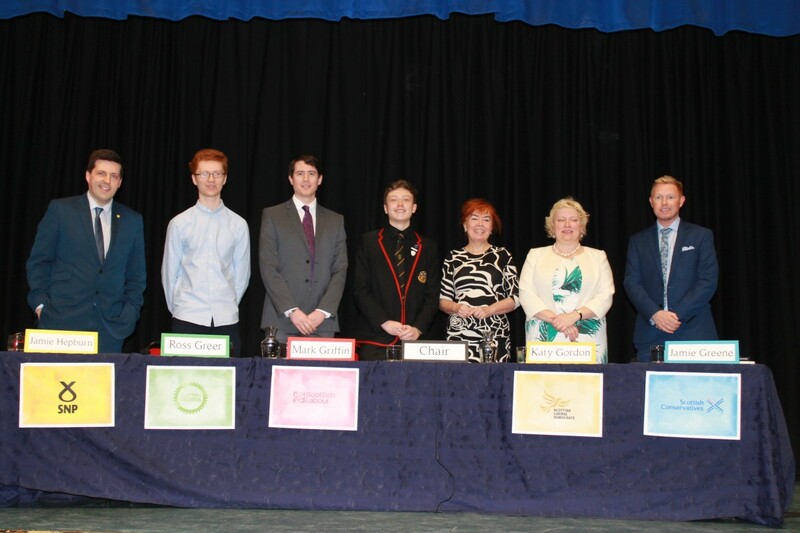 S5 and S6 pupils participated in an excellent Question Time event last week, featuring politicians from all the main political parties – Jamie Greene (Scottish Conservatives), Ross Greer (Scottish Greens), Mark Griffin MSP (Scottish Labour), Katy Gordon (Scottish Liberal Democrats) and Jamie Hepburn MSP (Scottish National Party). The panel was ably chaired by Mrs Carol McPherson, Education Support Officer at North Lanarkshire Council. Pupils chose a number of topical issues to ask questions about, in advance, and were also happy to pose questions from the audience. Our thanks to everyone who gave of their time to support the event – it is greatly appreciated by the school and the young people achieved greater political understanding from the event. Thanks too to Blair Anderson (S6) and his team, for organising the event, as part of the SQA Leadership Award. Well done! Our second group of S3 pupils enjoyed a great week of challenge and adventure at the Outward Bound Centre, at Loch Eil. The group participated in a wide variety of activities, alongside pupils from other North Lanarkshire schools. Many thanks to Mr Urquhart for accompanying the group. On Monday 29th February, there will be an Information Evening for parents of pupils in S2. This will centre on choices of subjects for S3 and implications for National Qualifications in S4. The meeting will be in the school assembly hall, starting at 7.00 p.m. The Parent Council will meet on Thursday 3rd March, at 7.00 p.m., in the school and new members are most welcome. Many thanks to the Rotary Club of Kilsyth, for once again giving up their time and expertise to provide our S4 with mock interviews. The interview and feedback contribute to the evidence for pupils’ ‘Self and Work’ unit and provide a valuable opportunity for the young people to demonstrate their employability skills. Archie Grant and Ross Quinn have made presentations to both the Pupil Council and Parent Council, outlining their recent experiences with the Holocaust Educational Trust. These included a day-trip to Poland, to visit the former concentration camps at Auschwitz and Birkenau, and the school is looking forward to welcoming two Holocaust survivors to share their experiences with S4 pupils, later this month. A group of S3 pupils – Kirsty Imrie, Ben McDowall, Jodie Owens and Megan Shaw – attended the North Lanarkshire ‘Speaking Up’ workshop, accompanied by Blair Anderson and Cameron Costiff, who were demonstrating good practice and acting as mentors on the day. It was a very enjoyable day and the pupils now feel better prepared to go forward to the competition phase, in the coming weeks. Two of our senior pupils, Connie McFarlane and Courtney Forsyth provided musical entertainment for the Kilsyth Senior Citizens group this week, as part of their Burns celebrations. The girls gave excellent performances, as always, and the audience was very appreciative of their contributions. Well done! Pupils in S1 have been issued with Tracking Reports, together with appointment sheets for the Parents’ Meeting on Thursday 11th February, from 4.15 until 6.45 p.m. We hope that there will be a good turnout of parents, to discuss progress during S1 and set targets for the year ahead. Our congratulations and best wishes to Mr Paul Dudman, on his appointment to the post of Teacher of Physics at Douglas Academy. Mr Dudman will be taking up his new post after the mid-term holiday and we wish him every success. The mid-term holiday will be on Monday 8th and Tuesday 9th February and there will also be an in-service day on Wednesday 10th February. The school will therefore be closed to pupils on these three days. The Parent Council will meet on Thursday 4th February, at 6.00 p.m., in the school.